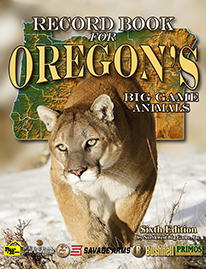 The NEW 6th Edition of "The Record Book for Oregon"
Full-Color Edition is chalked full of the "Best of the Best" Field Photographs of Oregon's Big Game! With over 25,000 entries recorded into separate divisions for Archery, Rifle, Black Powder and Shed Antlers. The NEW 4th Edition of "The Record Book for Washington"
Full-Color Edition is chalked full of the "Best of the Best" Field Photographs of Washington's Big Game! 8200 entries recorded into separate divisions for Archery, Rifle, Black Powder and Shed Antlers. Blacktail Legends of the Pacific Northwest. A grand new book, it´s been ten years in the making, and features forty stories with hundreds of photographs of these legendary hunters and the bucks they pursue. 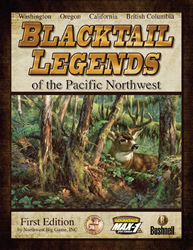 “Blacktail Legends” features a complete listing from Oregon, Washington, California and British Columbia of the top one hundred greatest typical Columbian blacktail and the greatest non-typical Columbian blacktail ever taken. Separate sections for Oregon and Washington record listings for the greatest Cascade blacktail deer, Columbian blacktail deer and Western blacktail deer, with separate divisions for rifle, archery and black powder. This book is chalked full of records and information on these “The Best of the Best” blacktail ever taken with an outstanding field photograph gallery. Now Available... Read A Sample! 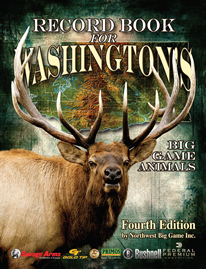 Record Book for Washington's Big Game Animals - Third Edition. 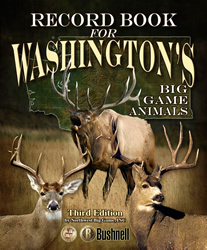 We are very excited about the new, hardbound, 3rd Edition of the Record Book for WASHINGTON'S BIG GAME ANIMALS. Since size really matters, we have more than doubled the total number of entries since the 2nd edition. Our newest edition is lavishly illustrated, all color, with great attention to detail! It is a difinitive source of big game hunting in Washington. Now with more than 7,000 entries in four categories: rifle, archery, black powder, and shed antlers. Species include bear, cougar, whitetail, blacktail and mule deer, rocky mountain and roosevelt elk, bighorn sheep, wild turkey, moose, and mountain goat. This third edition also features hunting stories by the actual hunters as well as a collection of rare historical photographs and exciting color photographs of recordsetting big game trophies. 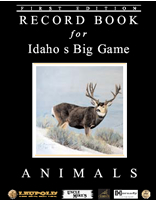 Record Book for Idaho's Big Game Animals, First Edition. This lavishly illustrated publication is the difinitive source of big game hunting in Idaho, featuring entries in four categories: Rifle, Archery, Black Powder, and Shed Antlers. Includes record entries for Bear, Cougar, Whitetail Deer, Mule Deer, Rocky Mt. and Roosevelt Elk, Bighorn Sheep, Wild Turkey, Pronghorn, Moose, and Mountain Goat. Featured are exciting hunting stories recounted by avid hunters and the superb work of the northwest's premier wildlife artists. This edition also has a large section devoted exclusively to exciting color photographs of record-setting big game trophies. This beautiful book will provide years of enjoyment and will be a priceless collector's item in the future.